710 Study San Rafael Neighborhood Posts: Uber Calls Woman's 20-Mile Nightmare Abduction an "Inefficient Route"
Uber Calls Woman's 20-Mile Nightmare Abduction an "Inefficient Route"
Several days ago, a Los Angeles Uber customer decided to leave a party for home early via UberX, the company's affordable taxi replacement. Instead of taking her home, the driver took her on a nightmare ride to an abandoned lot—and Uber doesn't seem to care. The passenger—who asked that I not use her name out of fear for her own safety—entered her home address in the Uber app before her ride arrived. 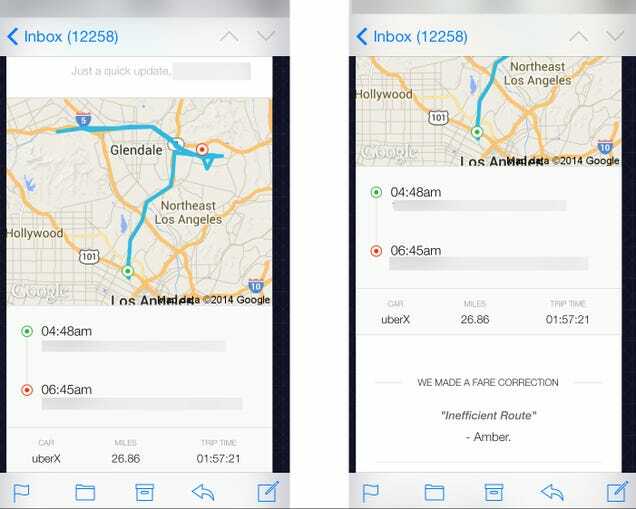 Uber touts this smartphone feature as a time-saving mechanism. But as seen in the screenshot above, provided by the passenger, she was taken almost 20 miles out of her way, while the driver ignored her questions and directions. They finally arrived in a dark, empty parking lot in the middle of the night, despite her repeated protests. When she tried to exit the car, her driver locked the doors, trapping her inside. Only when she caused a commotion and screamed did he finally return her home. What should have been a quick ride took over two hours. The next day, shaken, the passenger detailed her story to Uber. In response, she received only an "automated" email reply apologizing for the "inefficient route." The passenger's fare was partially refunded, with no acknowledgement of the fact that she was basically briefly kidnapped (she's now dealing with the LAPD and an attorney). A day later, the remainder of her fare was reimbursed. That's the extent of Uber's response. They seem sorry! Yes, there are dangerous people in any industry. Yes, there are dangerous taxi drivers. No, Uber isn't actively recruiting criminals and creeps. But the company demonstrates, again, and again, and again, that it cares more about beating back regulations and destroying organized taxi services than it does about you, your happiness, or your wellbeing. Uber is one of the only startups that's skipped straight to the large, unfeeling, contemptuous phase of any corporation—dismissing a kidnapping attempt as an "inefficient route" is so horrifically perfect for Uber that it comes off as a bad joke. But it's not a joke, and now a dangerous person—who Uber will of course remind you is not technically an Uber employee, but instead a mere independent contractor!—has this woman's home address. For now, she explained to me via telephone, audibly shaken, she's staying in a hotel. I've asked Uber for a comment, and will update if they reply.